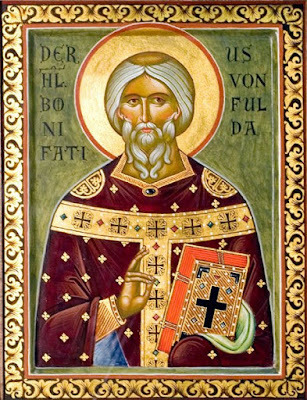 Our father among the saints Boniface (c. 672 - June 5, 754 or 755), the Apostle of the Germans, born Winfrid or Wynfrith at Crediton in Devonshire, was a missionary who propagated Christianity in Germany during the 8th century. His feast day is celebrated on June 5, the day of his repose. He was of good family, and it was somewhat against his father's wishes that he devoted himself at an early age to the monastic life. He received his theological training in the Benedictine monasteries of Adescancastre, near Exeter and Nursling between Winchester and Southampton, under the abbot Winbert, taught in the abbey school and at the age of thirty became a priest. He wrote the first Latin grammar produced in England. In 716 he set out on a missionary expedition to Frisia, intending to convert the Frisians by preaching to them in their own language, his own Anglo-Saxon language being similar to Frisian, but his efforts were frustrated by the war then being carried on between Charles Martel and Radbod, king of the Frisians. He returned to Nursling. Winfrid again set out in 718, visited Rome, and was commissioned in 719 by Pope Gregory II, who gave him his new name of Boniface, to evangelize in Germany and reorganize the church there. For five years he labored in Hesse, Thuringia and Frisia, and on November 30, 722, he was elevated to bishop of the German territories which he would bring into the fold of the Roman Church. 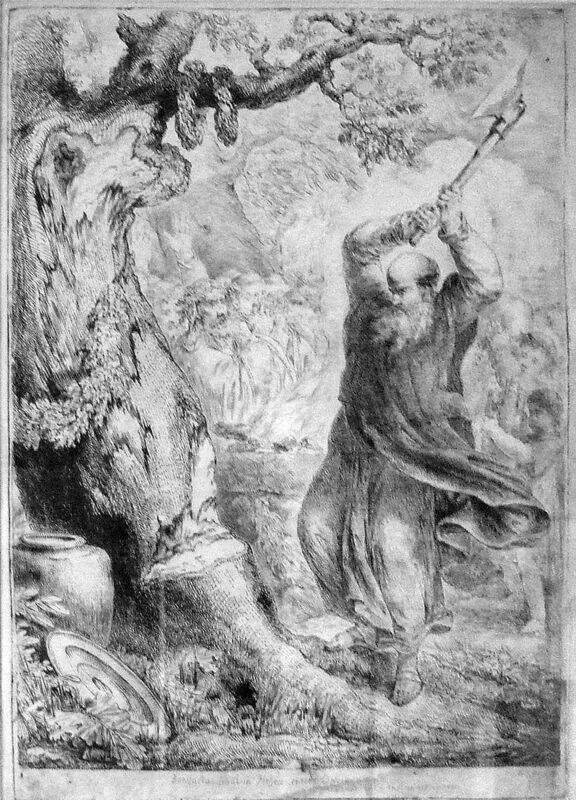 In 723, Boniface felled the holy oak tree dedicated to Thor near the present-day town of Fritzlar in northern Hesse. He built a chapel from its wood at the site where today stands the cathedral of Fritzlar, and later established the first bishopric in Germany north of the old Roman Limes at the Frankish fortified settlement of Büraburg, on a prominent hill facing the town across the Eder river. 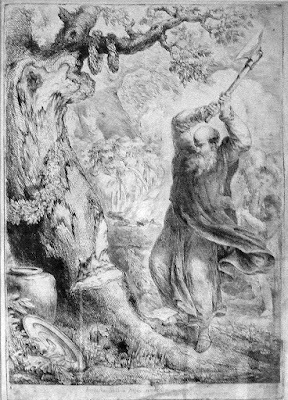 The felling of Thor's Oak is commonly regarded as the beginning of German christianization. In 732, he traveled again to Rome to report, and Gregory II conferred upon him the pallium as archbishop with jurisdiction over Germany. Boniface again set out for Germany, baptized thousands and dealt with the problems of many other Christians who had fallen out of contact with the regular hierarchy of the Catholic church. During his third visit to Rome in 737/38 he was made papal legate for Germany. In 745, he was granted Mainz as metropolitan see. After his third trip to Rome, Boniface went to Bavaria and founded there the bishoprics of Salzburg, Regensburg, Freising, and Passau. In 742, one of his disciples, Sturm (also known as Sturmi, or Sturmius), founded the abbey of Fulda not too far from Boniface's earlier missionary outpost at Fritzlar. Although Sturm was the founding abbot of Fulda, Boniface was very involved in the foundation. The initial grant for the abbey was signed by Carloman, the son of Charles Martel. The support of the Frankish Mayors of the Palace (maior domos) and later, the early Pippinid and Carolingian rulers, was important to Boniface's program of forcible conversion. The Christian Frankish leaders desired to defeat their rival power, the Heathen Saxons, and to take the Saxon lands for their growing empire. 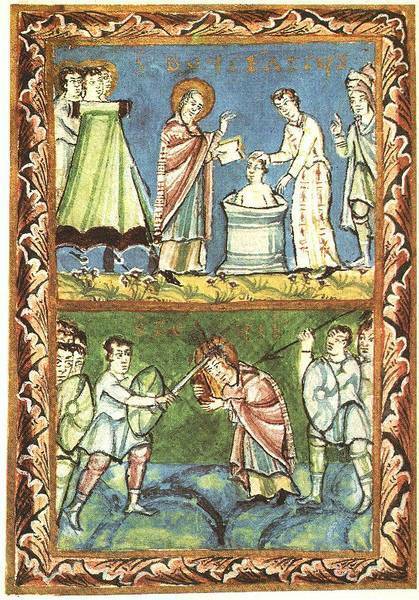 Boniface's destruction of the indigenous Germanic faith and holy sites was an important part of the Frankish campaign. Boniface balanced this support and attempted to maintain some independence, however, by attaining the support of the papacy and of the Agilolfing rulers of Bavaria. In Frankish, Hessian and Thuringian territory, he implanted the dioceses of Büraburg, Würzburg and Erfurt. He also organised provincial synods in the Frankish Church, and maintained a sometimes turbulent relationship with the king of the Franks, Pepin, whom he may have crowned at Soissons in 751. By appointing his own followers as bishops, he was able to retain some independence from the Carolingian rulers, who most likely were content to give him leeway, as long as Christianity was imposed on the Saxons and other heathen folk by whatever means. He had never relinquished his hope of converting the Frisians, and in 754 he set out with a small retinue for Frisia. He baptized a great number, and summoned a general meeting for confirmation at a place not far from Dokkum, between Franeker and Groningen. Instead of his converts, however, a group of armed inhabitants appeared who slew the aged archbishop. His remains were eventually buried in the abbey of Fulda. The forcible conversion of Germany up to the Elbe river was completed by Charlemagne, who destroyed Saxon independence in the last decades of the 8th century. A famous statue of St. Boniface stands on the grounds of Mainz Cathedral. A more modern rendition stands facing the cathedral of Fritzlar.